John and I might not have kids of our own, but we still very much consider ourselves parents. We couldn’t love our four fur babies more and would do just about anything to keep them safe, healthy, and happy. Of course, that statement might garner a smile and an eye roll from you traditional parents out there but from our point of view, we feel like one big happy family. 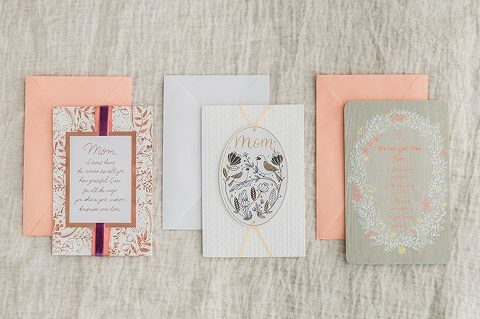 The two of us have fallen right into our roles as “mom” and “dad” with so much enthusiasm that we’ve even gotten into the habit of celebrating Mother’s and Father’s Day whenever the holidays roll around with some help from American Greetings. With three cats, one dog, and two humans living under one roof, we’ve got a lot to keep up with, and I know I feel very justified in spoiling John come Father’s Day because of all that he does for his family. We’d be lost without him. All this to say that maybe it’s time for all of us to think about celebrating the not-so-traditional mother and father figures in our lives. Think about it! I bet you can name at least one or two women in your life who give you all those good maternal feels on a regular basis. Maybe it’s a neighbor, a Godmother, a foster parent, or even a teacher. I just love the idea of treating these types of people to a little something special as a way to thank them for all they do for us and all the “kids” in their lives—humans and pets, alike. This Mother’s Day, I wanted to take that concept to a new level by treating my little sister to a care package full of goodies—complete with an American Greetings card to inspire her to go on an adventure with her own fur baby. She bends over backward for her dog, Rory, and I thought it was time to officially rope her into the whole “Pet Mom” Mother’s Day club. Scroll on for more inspiration, card message ideas, plus an exclusive Target Cartwheel offer to help get you started. If you’re anything like me, then you get a special little thrill from color-coordinating your gifts and care packages. If that’s the case, go ahead and start by choosing your greeting card. It’s an easy way to come up with a color palette so that you’re not stuck wandering store aisles without any direction. 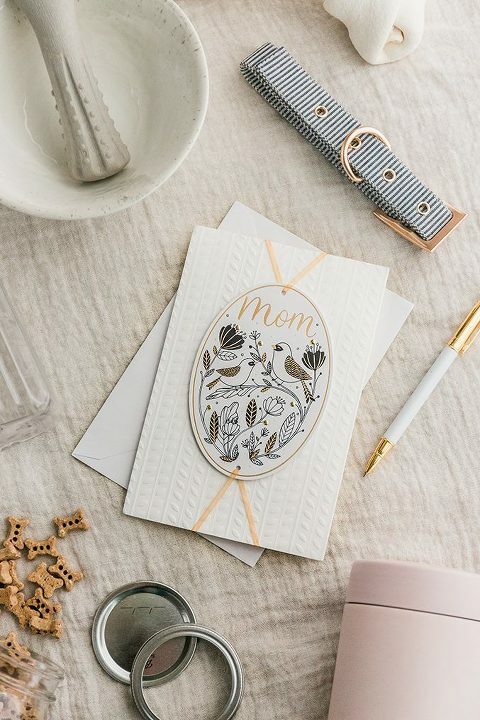 For my sister’s “Pet Mom” care package, I picked out a black, cream, and gold American Greetings Mother’s Day card that I know she’ll love. It has lots of subtle texture on the face of the card, and the monochromatic color scheme suits her minimalist style (she’s the type of girl who wears pretty much nothing but black). I could totally see her leaving this card out on her kitchen counter or fireplace mantel all throughout summer. While perusing the card aisle, I also picked up a couple extra ones to mail to my REAL mom and mother-in-law, too. I actually have a secret love for wandering between the greeting card shelves at Target because it makes me smile watching other people out of the corner of my eye (in a non-stalker way, promise!) as they choose just the right card for their special someone. Sometimes they’ll open dozens of cards before finding the right one, and then there are those people who end up laughing hysterically at the joke inside the very first card they pick up before heading right to the check-out line. John’s one of the latter types of card buyers, and I love that about him. No muss, no fuss, and he always ends up with the best picks. Now for the goodies to go inside the box beneath the card. I’ve noticed that nothing in the world makes my sister happier than spoiling her dog. In fact, whenever she starts to sink into a stressed-out mood on the phone, all I have to do is ask her a question about Rory and she immediately gets back to her happy place. So, even though this gift box might seem like more of a treat for her dog than for her, I’m positive that she’ll end up feeling so giddy knowing that she now has a chance to make her pup happy. That’s pet moms for ya! I chose a bunch of treats that I thought might inspire the two of them to go on an outdoor adventure together, including a plastic water bowl and bottle that won’t get broken if they go on a hike, a resealable food container and treats, a new collar, and a few new dog bones, too. I also threw in a Target gift card so that she can pick out something just for herself. I think we can all agree that the term “Mother” means a lot of things and that even if a woman doesn’t have children of her own, that doesn’t mean she doesn’t deserve recognition. Let’s make a pact to celebrate all the women who have had a maternal impact on our lives (or their pets’ lives!) this Mother’s Day. Click “Play” on that video above (or watch it in action over on my YouTube channel here) to get more details on the “Pet Mom” care package I put together. 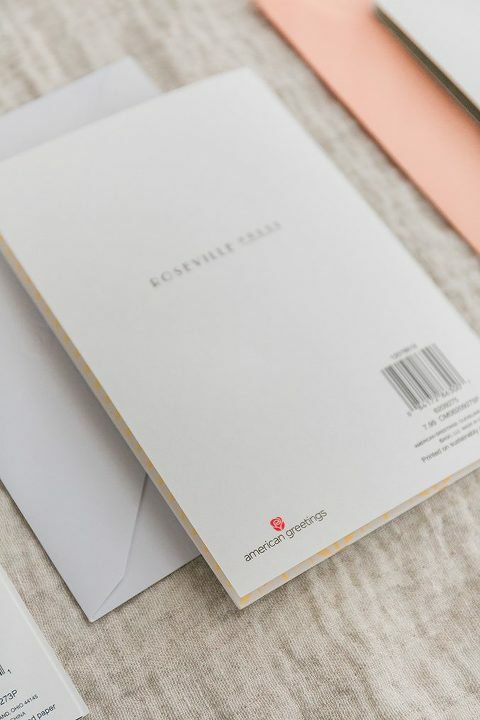 And in case you need help drafting the perfect greeting card message before the holiday on May 12, check out American Greetings’ “What to Write” page. Oh, and don’t forget to take advantage of the Target Cartwheel offer for in-store savings, too. Who are you going to celebrate this Mother’s Day? Tell me in the comments below! I’ve said it year after year, and my tune hasn’t changed—Valentine’s Day still isn’t a holiday I get all that excited about. I know, I know…I must sound pretty heartless, but I tend to be of the mind that love should be celebrated every day of the year, and that Valentine’s Day, in general, has gotten pretty commercialized—which is a shame! Please don’t get me wrong. If you love Valentine’s Day, by all means, do it up! My own sister, in fact, has always been a gigantic fan of the February 14th holiday, so I know I’m probably in the minority here. Despite my feelings about Valentine’s Day, I do look forward to seeing all those warm, fuzzy declarations of love pop up across social media the day of the big event. Knowing all of this, it should come as no surprise that John and I won’t be making a big deal out of Valentine’s Day this week. There will be the exchanging of cards and “I love you”s, of course, but we’ll skip elaborate gifts and probably won’t be going out to a big fancy dinner to celebrate. Instead, I thought it would be fun to challenge us to make the holiday feel special this year just by amping up our homemade dinner at home. I experimented with a few tricks in a little trial run one afternoon last week, and it turns out that you really only need to gather a few small pieces to make Valentine’s Day feel grand around your very own dining room table. Keep scrolling for the tips I plan to put to good use this Thursday for our real holiday dinner. Most days we just use everyday placemats on our dinner table, but for Valentine’s Day I wanted to make the table look restaurant-inspired. To get that vibe, I plan to lay down a white tablecloth that billows down the sides for an elegant look. Luckily, this type of “elegance” doesn’t require any money spent if you already have the cloth on hand! To create a sense of intimacy between the two place settings I’ll spread a pink runner across the space of the table between our seats. The runner you see pictured in today’s test-run set-up is actually a floral scarf that I already owned but repurposed as a table linen. One of the few things I plan to purchase fresh for our Valentine’s Day dinner at home is flowers. Even a tiny bunch of flowers from the clearance section at the grocery store will do. To make them look extra special and restaurant-worthy, just pop a few stems into bud vases and arrange them in the middle of your table. Of course, it wouldn’t be Valentine’s Day without ambiance, so make sure to pull out a candle or two to light up come dinner time. Most of us keep these types of accents around for special occasions, so it’s another way to save money this holiday. Corral a few lit candles in the center of your tabletop on a nice tray to create a centerpiece. One trick to make a plain votive feel worthy of the special occasion is to place it on a metallic plate, like the floral dish you see on our own table. By itself the little white candle would have felt lost and unimportant, but setting it on a gold dish instantly made it feel grand. As for food, I say don’t feel the need to go overboard! If you try out a few of the decorative tips I shared above, your everyday dinner table will feel anything but ordinary—so much so that even simple chicken salad sandwiches could make you feel like you’re out at a five-star dinner on the town. Cheers! I’m certain this isn’t my first time mentioning it here on the blog (in fact, it might be the third or fourth time—sorry! ), but I’m just really into the idea of transitioning our home over to mostly natural products. And that includes everything…right on down to home fragrances. Ever since I was a kid growing up in my parents’ house, I’ve been a big, big fan of sweet smelling things in a home. There was always a candle burning in my mom’s kitchen and season-specific outlet air fresheners in every room, so it’s not surprising that, as an adult, I’d keep up the tradition. That said, I’m excited to learn new ways to make that tradition a little bit healthier on our household. Namely, using products that are made from organic or natural products that don’t negatively impact the air we breathe. Scroll on to hear a few of the DIY natural home fragrance ideas I’ve picked up over the past handful of months doing research, and you’re also invited to tell us about your own chemical-free tips in the comments. This whole philosophy really got started after I heard through the grapevine (i.e. social media) that many home fragrances like candles, aerosols, and plug-in air fresheners come packed with harsh chemicals that could affect air quality and breathability if over-used. Crazy, right?! But I just wasn’t ready to ditch them altogether. I appreciate a nice-smelling home as much as the next person, and I often find that scent helps me manage my anxiety on a daily basis, too. The very first thing I invested in—and one of my favorite DIY natural home fragrance strategies ever—was an essential oil diffuser. I have one on my desk upstairs, and another set up in the lower level family room. Whenever I feel like our house is smelling a little stale or musty, I just fill the diffusers with water and add 10-15 drops of my favorite essential oils. I run the two diffusers all day long, and they fill the house with subtle scent that helps it feel fresh and welcoming for days. It honestly never fails to lift my mood whenever I catch a whiff of the fragrances as I walk from room to room. I also appreciate that I barely have to think about it, and the best part of all is that the essential oils are safe for anyone to breathe—from pets to humans. If you’re signed up to get the DGD Tribe newsletter every other week, then you heard all about my favorite alternate way of using oils: a homemade room spray. Every now and then I need a little concentrated burst of sweet scents (usually on the couch or chairs where our dog tends to nap), so I keep a DIY blend of vodka, filtered water, and essential oils handy in a little spray bottle so I can give the fabrics in our home a refresh from time to time. My favorite combination right now is lemon, lavender, and grapefruit. It smells so light and happy! If you haven’t quite gotten into the whole essential oils craze, don’t worry. There are so many other ways to make your home smell good without them. Just last year I gave DIY soy-based candle-making a try, and am happy to report that it’s super easy and makes all the difference inside a home whenever it needs a little scent boost. Find out how to make your own candle (including the natural ingredients shopping list) here. A few other DIY natural fragrance ideas to consider? You could try simmering a pot of water on the stove with cinnamon sticks and orange slices, or make your own vanilla spice air freshener by heating and mixing white vinegar, water, cloves, and a small amount of natural vanilla extract in a spray bottle for a grab-and-go room spray that isn’t harmful on your fabrics or your sinuses. In case you’re curious about which specific products I’ve used so far in our natural home fragrance experiments, this is the diffuser I use (you can see it next to the plant in that photo above), and this is my favorite website for essential oils. If you want more ideas, the best tip I have is to Google “Natural Home Fragrance Ideas.” If you do that, you’re sure to stumble upon all sorts of similar posts to the one I’m sharing here today. The cool thing I’ve found about natural home fragrance projects is that many of them use pantry staple items, so you might even be able to whip one up for free as soon as you close out of this window in your browser. Let me know which ones you’ve tried—or that you plan to try—in the comments below so that we can all trade ideas and reviews! This may sound strange, but one of my favorite ways to spend any downtime between Christmas and New Years is with organization projects. It’s one of the few times during the year that I get true time off, so I often spend it getting down to business on the home projects that got put off throughout the other seasons—things like weeding through my clothes, reorganizing kitchen drawers, and taking a long, hard look at the home décor I keep stored away for no good reason anymore. 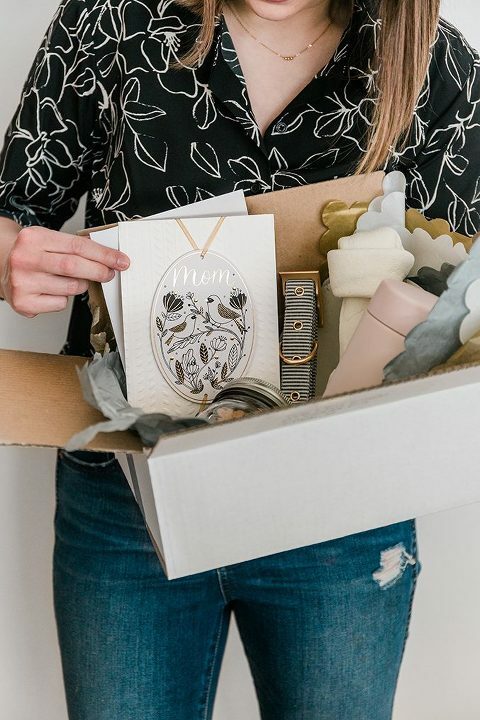 I managed to do exactly that over this past holiday season, and, throughout the process, kept a running mental list of all the things we did in case you’re looking to declutter your own space in honor of the new year. Keep scrolling for five of the biggest takeaways I can offer, and then be sure to share your own tips in the comments so we can keep our collective motivation going through spring! 1. Use old Tupperware as drawer dividers: John and I spent one afternoon just after Christmas going through our Tupperware collection, and ended up finding a few containers that didn’t have matching tops for whatever reason, or that had just generally run their course. Instead of throwing them away or donating them, we decided to use the containers as recycled drawer organizers. They’re now playing host to odds and ends in our junk drawer to keep things separated and more readily accessible. It may not be pretty, but it works—plus it was free! 2. Make the most of closet shelving with removable boxes that have drawers: If you have a shelved hall or linen closet in your home like we do, then do yourself a favor and store up. In other words, invest in a few inexpensive organizers with drawers, and set them on the shelves so you can take advantage of that often-neglected negative space in between the shelves. As an example, we keep all of our medicine in labeled drawer organizers in the hall closet so that the bottles aren’t cluttering our kitchen cabinets or drawers. Use this life hack to store small things vertically, like jewelry, extra beauty products, or even your receipts. 3. Style exposed storage solutions that are pretty to look at in addition to being functional: Sometimes clutter just can’t be avoided, especially when you need certain items to be within extra easy reach (think: coffee pods, everyday jewelry, etc.). For those items, disguise them as décor by using decorative bowls and handmade jewelry stands to corral them. That way you can keep these things out in plain sight, but they look more like intentional décor than usable clutter. 4. Hide excess stuff in matching baskets: John and I used to keep our most-often-used folded clothing out on the shelves in our closet, but it started to look really messy and cluttered. So I bought six matching white baskets from Target (similar option here) to keep those everyday pieces within easy reach but hidden from sight. It instantly made our closet look cleaner, but everything is still really accessible. Try this trick with just about anything that you keep on closet shelves—from stacked magazines and books, to shoes and accessories. 5. Put furniture pieces with drawer storage in every room: It may seem a little strange at first to put a dresser in your living room or dining space, but trust me when I say that these types of pieces are game-changers when it comes to hiding clutter! We have furniture with drawers in every single room in our house (even the bathroom) to help hide away the things we use all the time—board games, extra batteries, cake stands, cords, and guest linens. It’s much easier to disguise a dresser as a console table with clever styling then it is to try and hide clutter in a space with no hidden storage options. What decluttering tips am I missing in this list? I know you guys have all sorts of clever organization solutions to offer, so please tell us about them in the comments. I’m working on a much more involved post all about drawer organization (five ways to do it, in fact! ), so stay tuned next month for that. In the meantime, let’s keep the conversation going—share your own decluttering ideas below. Happy Holidays & See You In 2019! And just like that, 2018 has come to a close here on Dream Green DIY! Thank you so much for all of your support and encouragement this year. I can’t even begin to describe to you what it has meant to have all of you along for the ride on my eighth year of blogging. Click back here to see all of the fun projects I worked on throughout 2018, and I hope you’ll stop back in bright and early on January 7, 2019, as I kick off a brand new year of DIY crafting, building, and renovating. I’ve got so many ideas floating around in my head that I can’t wait to make good on, so I hope you’ll stay tuned. As always, if there’s anything in particular that you’d like to see me focus on or try out, by all means, let me know about it in the comments, or you can shoot me a message here. I’m headed out of the office for the next two weeks to enjoy my annual winter break, and I hope you all are going to have the chance to take some much-deserved time off, too. Whatever you get up to between now and the new year, I hope it’s full of creativity and goal-setting. This is the perfect time of year, after all, to sit down and have a heart-to-heart with yourself about all the things you’d like to accomplish in the year ahead. I dare you to think really big! I know I will be. I’m “officially” out of the office until January 7, but will be posting a special New Years Day message here on DGD like I do every year. Check back on the first day of January for a quick-but-candid post detailing everything I have planned for the blog throughout 2019. I’ve got a few big changes I can’t wait to roll out across this digital space in the new year, and I’ll be sharing (big) hints as to what those changes will be first thing on New Years Day. Oh, and if you’re curious to know what my personal resolution is going to be for 2019, make sure you’re signed up for the DGD Tribe newsletter, too, because I’m planning to shoot that out to inboxes everywhere on January 2. Sign up here to get on that list. Happy holidays, everyone, and I’ll see you next year! P.S. Keep an eye on the DGD Pottery Etsy shop over the next two weeks for a special post-holiday sale. And for those of you still waiting for something to strike your fancy, I’ll be adding all-new items to the shop at 9am EST on January 17, so mark your calendars! Just five more sleeps until Christmas morning! Are you ready and all set to go for Tuesday morning’s festivities? I’m just about ready, but, nevertheless, feel a little anxious that I’ve forgotten something. That feeling is probably thanks to the amount of to-dos I still have on my list of deadlines for work, but all of that will be done by the end of the day tomorrow, and I’ll finally (finally!) be able to relax and enjoy all the excitement that comes with Christmas and New Years. For those of you who can relate and tend to feel a little on edge or overwhelmed in general this time of year, I put together a list of eight ways to de-stress and decompress. Scroll on for my tips, and picture me over here trying to take a cue from my own book, too! 1. The very first thing on my list? Learn to say no! This time of year can be especially hard on people who suffer from social anxiety (like me), so go ahead and decline that holiday party invitation that’s been weighing on your mind. If the host is a true friend, they’ll understand. When you graciously decline, though, maybe suggest planning a post-holiday lunch date to catch up. 2. Don’t overextend your creativity on presents. If you’re still buying gifts for people, consider asking your family members to give you their specific wish lists. That way you can be sure you’re getting them something they’ll actually use and love. 3. Eat healthy foods. Even if you trade in just one carb-heavy dinner this holiday season for one packed with vegetables instead, you’ll inevitably feel more energetic and less stressed. 4. Turn off the television and play a board game. Bright digital lights from a TV can cause eye strain and anxiety, so dim your table lamps, turn Christmas music on low in the background, and get back to basics with a family game night. 5. Give yourself license to skip the hassle of wrapping gifts this Christmas. Instead of struggling with tape, scissors, and perfect lines, use bags (or even fabric) to loosely hide your presents from their recipients’ view. 6. Think of quick yet effective ways to give back this Christmas. I was going to suggest volunteering at a homeless shelter, but then my mind started spiraling at the thought of trying to work something like that into an already-packed holiday schedule this late in the game. Instead, go buy some coats, gloves, and hats, and donate them to your local homeless shelter. 7. Keep up with your routine. Sometimes, breaking away from the activities you’re used to during the rest of the year can make you feel thrown off, so stick with your weekly yoga class, morning meet-ups, and bedtimes this holiday season. 8. Stop for a moment at least once a day to think about the big picture. Think about what Christmas means to you, or try visualizing a couple of positive goals you want to make for the new year ahead. You could even simply tell yourself that this, too, shall pass in just a couple more weeks! Having a mini check-in with yourself puts things into perspective, and can help you recenter before tackling another potentially stressful holiday to-do list item. How do you de-stress over the holidays? Or are you the type of person who can sail through Christmas and New Years with a big ol’ smile on your face despite the chaos surrounding you? I wish I could be more like that latter group of folks, but, alas, I think I’m always going to be just a tiny bit high strung this time of year. Even still, I always look forward to these festive holidays, and wouldn’t trade the occasion for anything in the world. Leave your own tips, if you’ve got them, in the comments below. I absolutely adore getting dressed up this time of year. The only problem is that I’m a pretty staunch homebody, so I have nowhere to actually go in all my fancy finer. This holiday season I’m trying to change that mentality by getting out of the house more often. I’m making a point to pop out to a coffee shop for lunch just because, and I’m also sneakily scheduling a few extra weeknight dinners out so John and I have the excuse to dress up in honor of Christmas and New Years. For even more motivation and inspiration, I spent the morning coming up with two dream holiday outfits that I’d love to wear this season. As you might have noticed, I tried my best not to go overboard with too much holiday-themed glamour so that these pieces could be worn all winter long. I love that any of these pieces can be mixed together, too. If you’ve been considering going the capsule wardrobe route, the 13 items I listed above combine for a great jumping-off point. The Fair Isle Crewneck, for example, is the perfect topper for those Work Pants, and the Lurex Turtleneck is a no-brainer for tucking into the Mini Skirt. Because everything is in the same general color palette, you can mix and match to your hearts content well past Christmas. Which outfit is your favorite between the two? It’s definitely not a secret that everything inside our house is pretty thought-out. I think I have my OCD tendencies to thank for it, but not a single stack of books, piece of art, or patterned throw pillow is placed in one of our rooms without meticulous pre-planning. The same philosophy even goes for things like tissue boxes! Tell me I’m not alone in this, guys. At any rate, John knows that if he comes home from the grocery store with a generic looking tissue box, it will inevitably end up inside a cabinet because I just can’t stand looking at it alongside our antiques and other décor. He’s gotten really good at taking the time to find patterned tissue boxes that actually match our aesthetic because he knows it’s the only way I’ll leave them out in the open. One brand that consistently checks that box (pun unintended) is Scotties Facial Tissues, and today I’m excited to be teaming up with them for a Christmas craft inspired by their seasonal box designs. As you know, I ended up with a pretty bad cold a couple of weeks ago around Thanksgiving, and inevitably went through several boxes of Scotties tissues in the process. Instead of throwing them away (the wintery designs are just too cute! ), I decided to hold onto them and turn them into DIY Christmas gift tags. Scroll on for the tutorial and craft supply list—printable template included. Download the printable tags template here, and print the page onto regular computer paper. Cut out each shape, and discard the trimmings. Lay the larger circle, larger triangle, and the smaller star shape on thick cardstock, and trace the designs onto the paper. Cut them out. Note that I actually used a cream-colored cardstock because I liked the subtle contrast between that color (versus pure white) and the holiday tissue box patterns I used. Lay the remaining tag templates you first printed and cut out (the smaller circle, smaller triangle, and larger star) onto the sides of empty Scotties tissue boxes, and trace their shapes onto the cardboard using a pen or pencil. Cut the shapes out with scissors. Pair up the shapes, large with small, and glue them together using rubber cement. Allow the finished layered tags to dry fully for at least an hour (or more if you decide to use tacky glue) before handling or moving on to the next step. Punch a hole through the top portion of any tags that you want to tie onto your gift boxes. For these, you’ll loop through a piece of short leather cording or twine. On the other hand, you could leave the tags unpunched, and attach them to gift boxes using pieces of pretty patterned washi tape. You’ll see it both ways in these demonstration photos. Before attaching your finished tag to the gift box, though, make sure you write out the person’s name on the blank side of the tag using a paint marker. I like to go the extra mile with calligraphy-inspired handwriting, but don’t think—even for a second—that I know how to do that on my own. I just go on Pinterest, type out the person’s name and add the word “calligraphy” on the end, then see if the name pops up in an image that I can copy. Easy as could be, but looks a lot fancier than my own everyday handwriting. The holiday boxes from Scotties made this project so easy to pull off, and I love, love, love that it made good use of something we already had lying around the house. I’m all about reducing waste and saving a buck or two. I also think this would be such a fun excuse to get friends together for a festive craft night. It doesn’t have to be anything overly fancy or thought-out—just text a few best friends and invite them over for gift tag making, then get to crafting with Christmas music or a holiday movie on in the background. Which gift tag or box design is your favorite from the bunch? I always find myself taking my time choosing what tissue box I like best when buying tissues. Now I have even more reason to. Love these tags… so clever and pretty. I find more joy in reusing and repurposing paper than in buying new paper to craft with. Happy Monday, everyone! Did you enjoy a nice relaxing weekend like I told you to? I think it’s so important to prioritize self-care right now since we’re all likely in the midst of a super chaotic holiday season. Even if you’re not traveling or hosting a big group of family and friends for Christmas or New Years, chances are good that you’re having to accommodate all of those people around you who are. John and I drove out of town the other day to do some Christmas shopping in a nearby city, and we had a helluva time avoiding impatient drivers and stressed-out shoppers. It’s the nature of the beast, if you will, this time of year, so make sure you set aside some time for self-care these last couple of weeks of the year. Today, I thought it might be fun to share one of the simple little stress-relievers that I’ve added to my own holiday routine this year. Every few days, I make myself a cup of this Christmas Coffee Cocktail, and it does wonders to soothe my racing mind. Keep scrolling for the couldn’t-be-easier (or sweeter!) recipe. Combine the first three ingredients in a mug, and then pour the fresh coffee over top. Stir to combine, and serve hot. The drink is sweet enough on its own, but if you want to go the extra mile, try adding cinnamon sugar to the rim of your mug before mixing the drink. A dollop of fresh whipped cream wouldn’t hurt either. Cheers! P.S. If you enjoyed today’s post, you’re going to love what’s coming in this week’s DGD Tribe newsletter! Sign up here to get on the list before the last newsletter of 2018 goes out on Wednesday.